North Carolina-based Marines will make it into the next book of Guinness World Records for achieving the longest push-up chain in history. Marines and sailors who performed a 138-person chain push-up broke the Guinness World Record, the organization annouced last week. Guinness World Records announced the fan favorites for records broken this year on Friday. 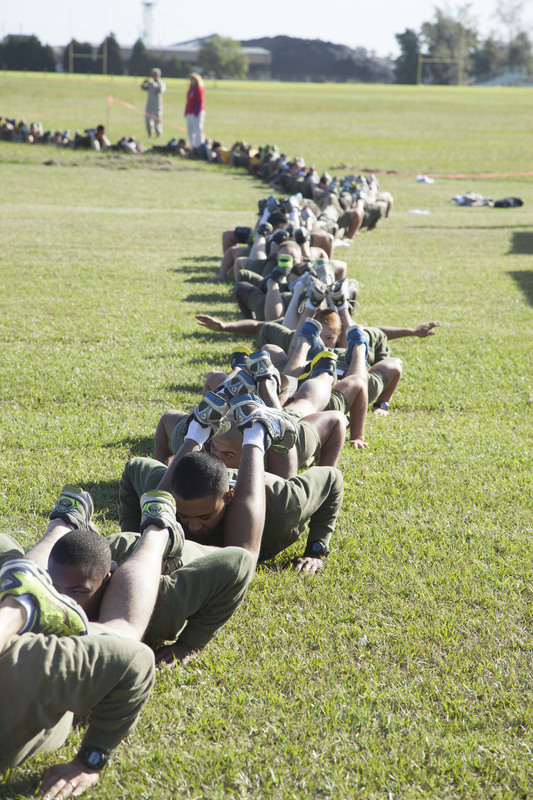 Included was the longest chain push-up, which involved 138 Marines and sailors. They were linked together while they completing three push-ups, with their legs resting on the shoulders of the person behind them. The attempt to break the record took place in September aboard Camp Lejeune, N.C., according to a Marine Corps news release. The event was organized by Camp Lejeune’s Single Marine Program. Cpl. Andrew Zheng, a musician with the 2nd Marine Division Band, said he initially wanted to hold the attempt to break the record in his home town, but once he saw the interest from Marines, he decided to enlist the help of the Single Marine Program organizers, according to the release. They began researching the proposal to set the record. The planning took five months, the release states. After linking all 138 Marines together, Zheng gave the command to perform the three push-ups over a loud speaker. They submitted evidence to the Guinness World Records headquarters for evaluation. Other fan-favorites this year included the largest human water-skiing pyramid, the world’s tallest sunflower and the longest conga ever performed on ice. You can vote for the Lejeune Marines as your fan favorite here. And i bet none of these Marines can call for fire or call in a 9 line. Good job training. lol got’em, beautiful point DTRON. Corps is getting softer. EVERY MARINE should at least know their Zmist if not a 9 line.